Today is Purim. It is a joyous holiday where Jews celebrate the defeat of Haman’s plot to annihalate the Jews of Persia. And while I was excited to attend our community’s Purim Carnival, I tossed and turned last night. What if a bomb threat was called into our JCC in the middle of the Carnival. What would be our plan to get out quickly and safely? Luckily, our community’s Purim Carnival was joyous (& full of security). However, as I scrolled through Twitter this afternoon, I learned JCCs in Rochester, NY, Milwaukee, WI, Indianapolis, IN, & Vancouver, BC had a bomb threats on what should be a festive day. I long for the days when my greatest concern was whether or not we’d be able to find a close parking spot. Walking through the cold seems trivial now since there are real concerns. Nevertheless, people were not deterred. I saw more people I knew at our JCC for today’s Purim Carnival than I have in the past. That is a wonderful thing, right? 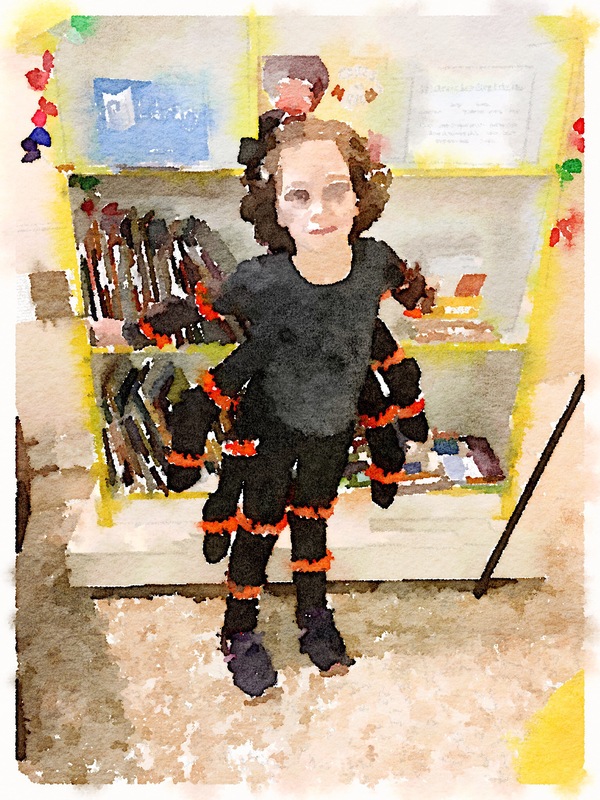 Isabelle asked her Zayde to make her a spider costume so she could be Sammy Spider (from the Jewish book series). He said yes. Good thing he did because, as you may remember from last week, I’m not exactly a creative visionary when it comes to dressing up! Yes… I remember those days. Purim in Israel, now that’s FUN! I am so sorry and upset that you even have to think about this. AAaaargh. (Isabelle’s costume looks amazing, BTW). So glad it was a great day and nothing happened!! First of all, the costume for Isabelle is awesome! Really incredible! Purim is a joyful time, and I am glad you could celebrate joyfully. It is heartbreaking to think that JCCs must have high security and be on alert for bomb scares and such. Stacey, you remind me that I miss time at synagogue and am looking into some close to me. I may join, even if I attend without my husband (who attends church on Sundays without me). When I read about your celebrations of Jewish holidays, I yearn to be a part of it again. When I read your post, it sounded so much like one of Anne Frank’s early letters. I was chilled. I too worry as to where we are heading as a country and what decency will we demand of our leaders. Will the majority of Americans be lemming-like and just go along? Will they stand up? I want to think so. But frankly, after the last year I have less certainty. I’m glad so many came out for Purim. Your daughter looks lovely and spirited in her costume. I’m glad the day was joyous. I am glad that you were able to go and have a wonderful time. I wish you had been able to do so without the shadow of these threats hanging over you. It is a happy celebration despite the news of more threats. I wish there was something more all of us could do to help. I love the spider costume. Isabelle must have loved it too. It is sad for celebration to be touched by these threats. I am sorry to see this happening. We pretty much wrote the same post! It’s so scary lately! And I love that Isabelle was Sammy the Spider and that it was her Zayda that helped make the costume! Impressive!